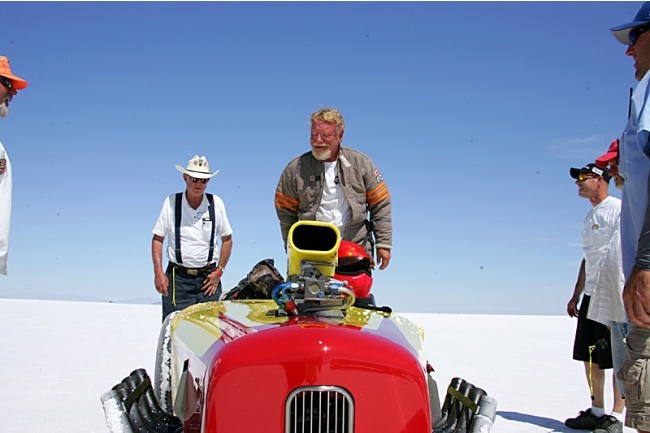 Larry visits Roy Lewis, the first man over 300mph with diesel power in 2006. 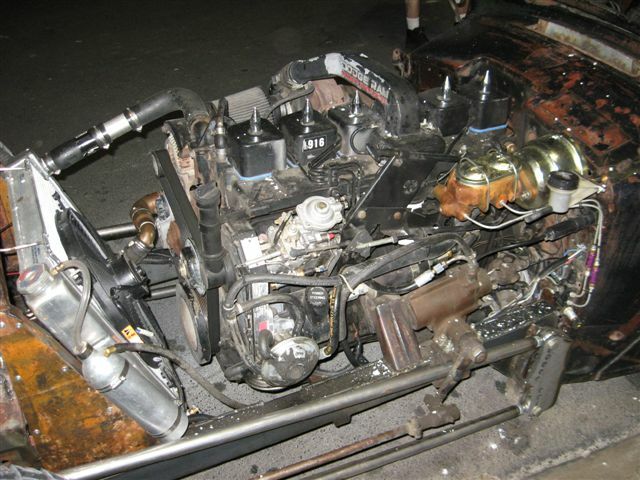 Then Roy had one Cummins 6BT but now has two. Roy is very humble guy and that somewhat hides his brilliance. He will be the man that goes takes the record back to North America at over 350mph is my bet. Would this called a 12TBA 48valve Cummins? The stretched car sure looks like the original, Nice work Roy! waiting for the course to be 'locked down" for Roy's run. 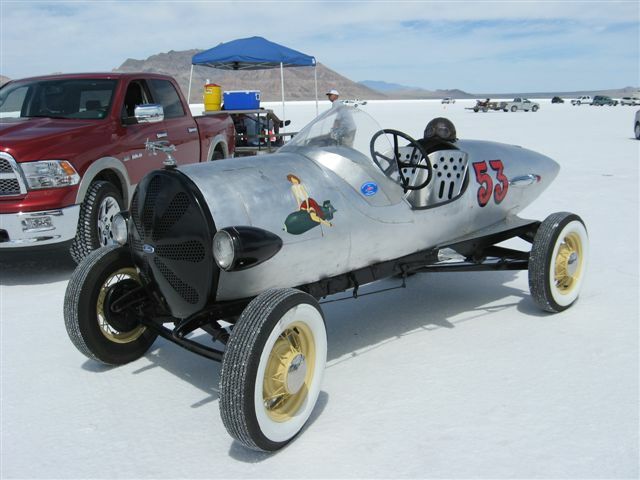 Teething problems kept the Chassis Engineering Special from its potential 400mph speeds. Everyone says "this is awesome totally Fu**'n awesome!" Larry has his eye on the car body? 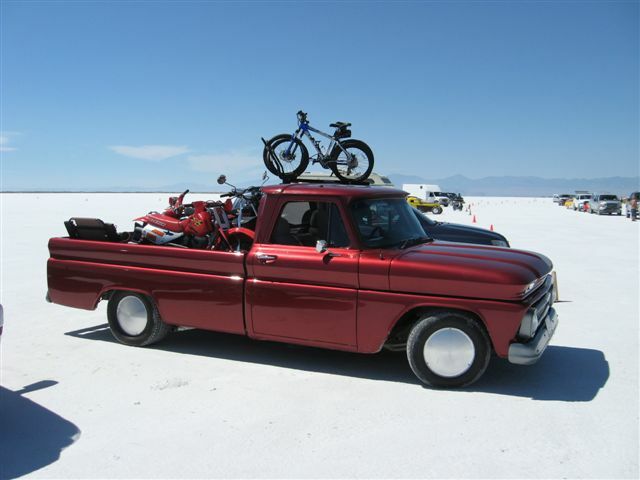 Dennis admires one of five hundred hot rods at Speedweek. Some show car people say "I wouldn't take my car out on the salt." Racers understand that there is a car wash and perhaps rain on the way home! Grandad had a SAAB and it didn't look like this. as you break over the hills and see Wendover and "the salt flats"
The next great treat is arriving at the Bonneville Sign and being welcomed by non other that the cheerful ambassador to speed events, "LANDS END LYNDA" and her Daughters. She has many other volunteers to assist her but she is a constant. Each year the "Hawk has arrived she has already secured the Nitrous bottles for us and greets everyone on the team with big hugs and smiles. Thank you to all the volunteers that make Bonneville the fastest place on earth. Lands End Gate worker welcomes Dennis Hicks (almost my cousin 2) .Dennis is well known as a Funny car owner driver and now has a front engined dragster for nostalgia racing. 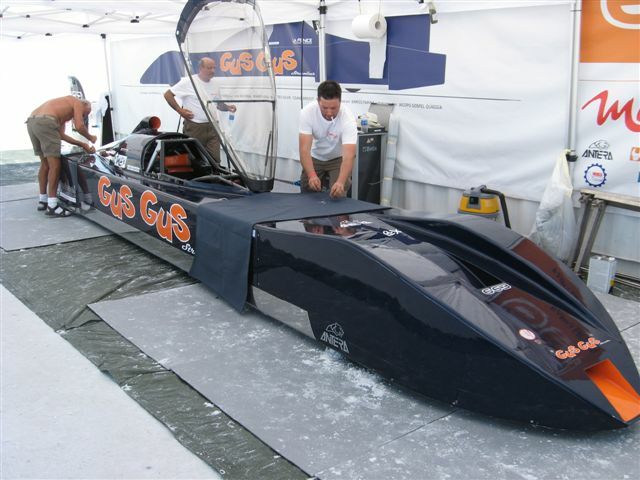 New car from ITALY went 300+ mph with Chevy Indycar engine. Good job! Ranger relaxes with Cameron or A boy and his best friend out for a ride. Cameron and DQ bring the camping toys to the Bend in the Road each year. Thanks to our friend and team mate DQ for sharing some of his pics from Speedweek. Cameron dressed in Speed demon colors poses with his friend. 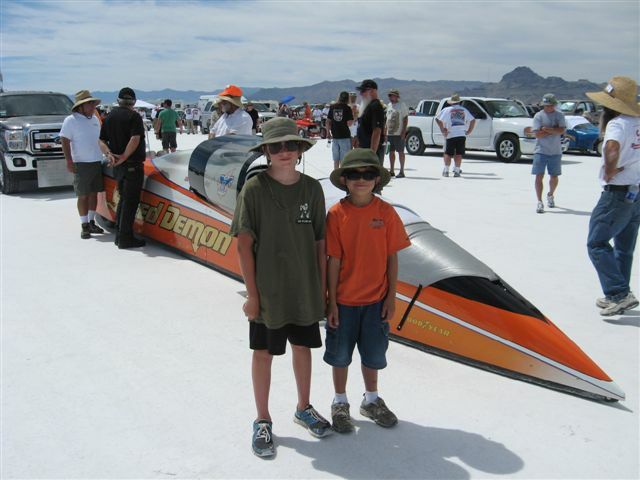 Cameron has his birthday at Bonneville each year. Ken Rouble, decked out in his Goldenhawk team shirt, gestures to the sign on the building. Gears and Rears, we put our trust in the quality work of ROD FARROW for the changing up the gear ratio of our final drive from the original 2.50:1 to 3.50:1 with a spooled centre carrier. This change in gears means that the car could run over the current AA/DS record of 318mph and keep the engine rpm in a safe range. Aurele Gagon (L), Ken, Justin Howat(R) roll out the drive assemble to load. Thanks to Tony Rodrigues for his assistance and to Aurele for good wishes. 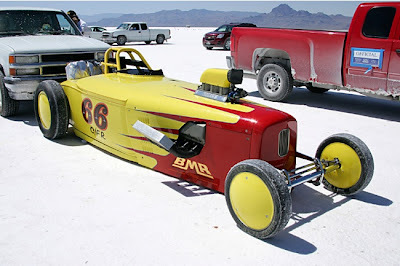 One of the best the fastest hot rods in the world! Congratulations to the BMR Team, GREAT JOB! These guys were our guiding angels as we struggled to get the new Goldenhawk through tech inspection as a new streamliner in 2009. As I recall, Alan had spun at over 265mph in the early morning and once he was out of his fire suit came right over to our pits to oversee the changes being made. He never even mentioned that he had run, much less spun at that speed. The man is very cool. Thanks again and it is great to meet such unpretentious people. 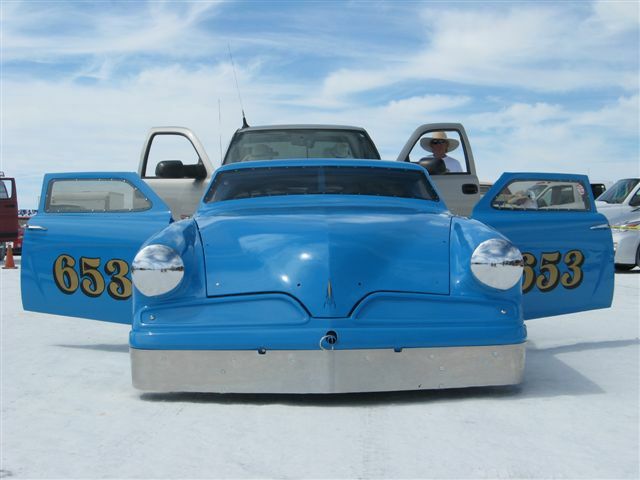 He set 288mph Record at Speedweek 2011!